In 1792 a group of nonconformist Particular Baptists were praying together about what could be done for missions. Many Particular (Calvinistic) Baptists did not believe anything could be done by human means to reach people in foreign lands. 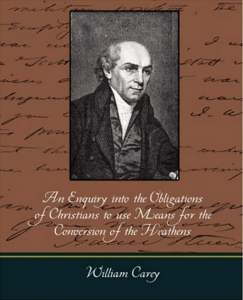 In May of that year William Carey expressed his own heart in the above titled booklet which was first printed and distributed in the town where he pastored, Leicester, England. Later that summer the association met in Northampton where Carey urged his fellow ministers that they must “expect great things from God and attempt great things for God.” By November of that year the booklet had such an effect on the churches of the association that the Baptist Missionary Society was formed and Carey was the first missionary. As to the question of whether the Great Commission was given just to the Apostles or to all Christians, Carey answered by asking whether the command to baptize was just for the Apostles also, and whether Christ’s promise of His presence was just for the Apostles. Carey’s simple but profound Biblical logic won the day. The “means” to be used was faith missions; independent missionaries supported by individual churches. Andrew Fuller was the life-long secretary of the Mission and Carey lived all his life and was buried in India. Carey said to Fuller, “I go to India to mine for souls, you hold the rope!” And modern missions was born!